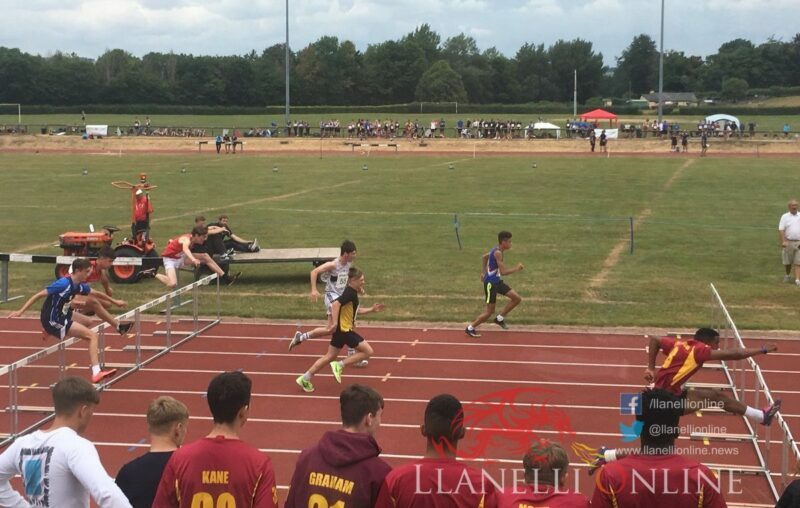 IT’S been a busy week for Secondary School pupils across Wales with two big events having been held in the space of four days. 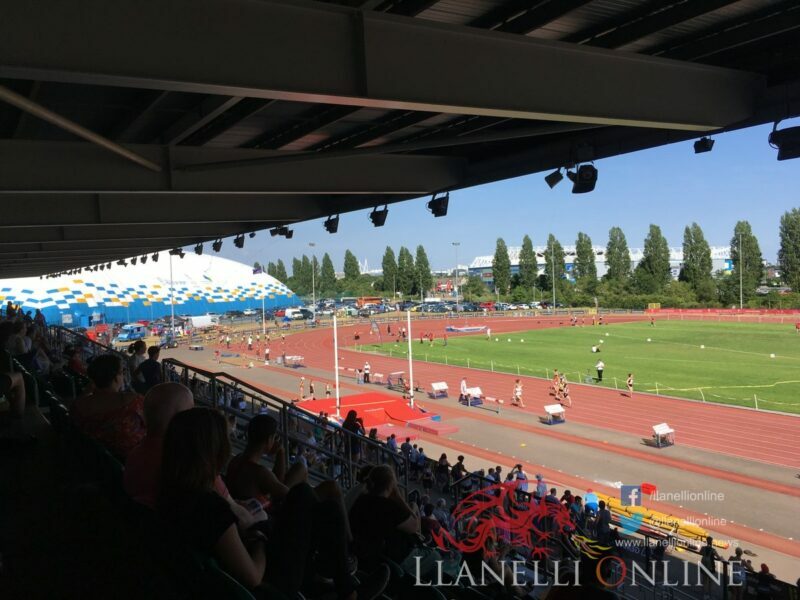 Over 500 of Wales’ top school pupils headed to the Cardiff International Sports Stadium in Leckwith on Saturday 7th July for the 2018 edition of the Welsh Schools National Track & Field Championships. 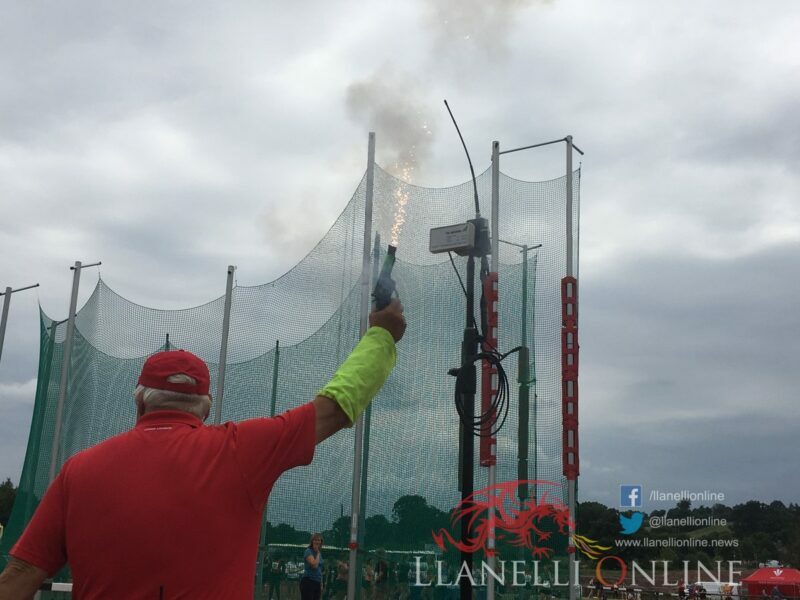 The sun was again shining over the track with temperatures soaring into the high 20 Celsius as the races heated in the competition arena as athletes scored for their districts. 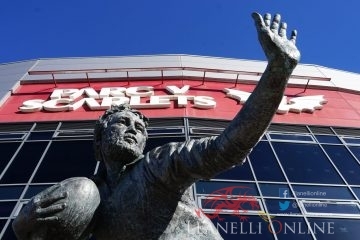 All those taking part were selected to represent one of the eight districts from Afan Nedd Tawe, Cardiff & Vale, Dyfed, Eryri, Glamorgan Valleys, North East Wales, Powys and South East Wales. The age groups were junior (year 8 & 9); middle (year 10 & 11) and senior (year 12 & 13). 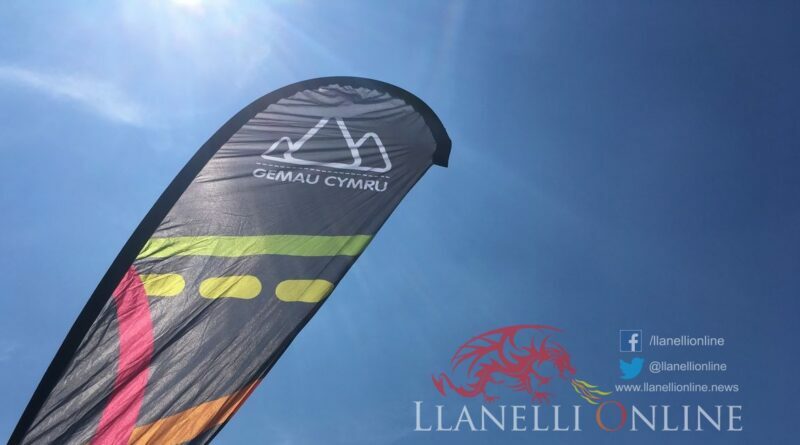 For the seventh successive year, the championships made up part of the Urdd’s “Gemau Cymru” bilingual event for hundreds of young people in the Welsh sporting calendar. 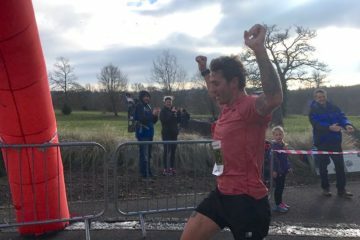 It provided an opportunity for talented young athletes to compete in a high profile multi-sport event across Cardiff, Swansea and Y Bala. 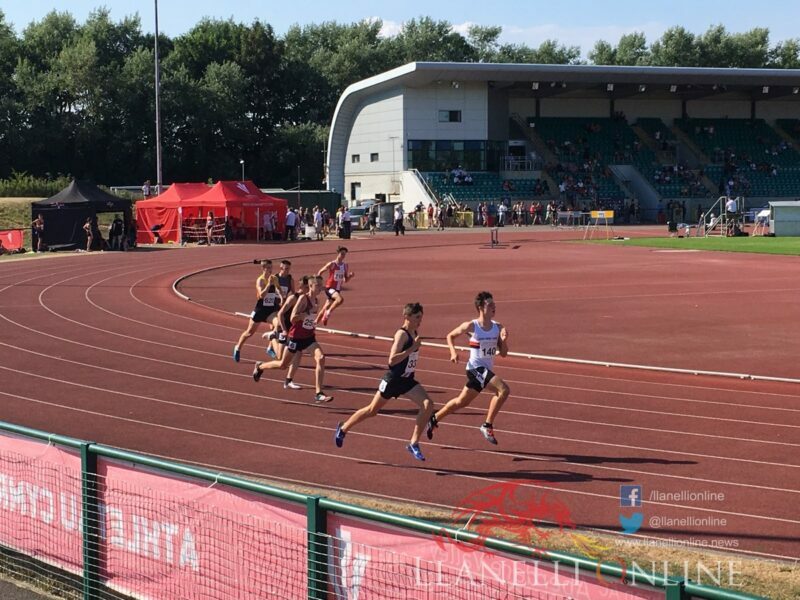 SIAB Schools International call ups were at stake as the annual fixture between Wales, England, Scotland and Ireland goes to Grangemouth in Scotland this coming weekend (Sat 21 July) and will feature several of the West Wales regional athletes. 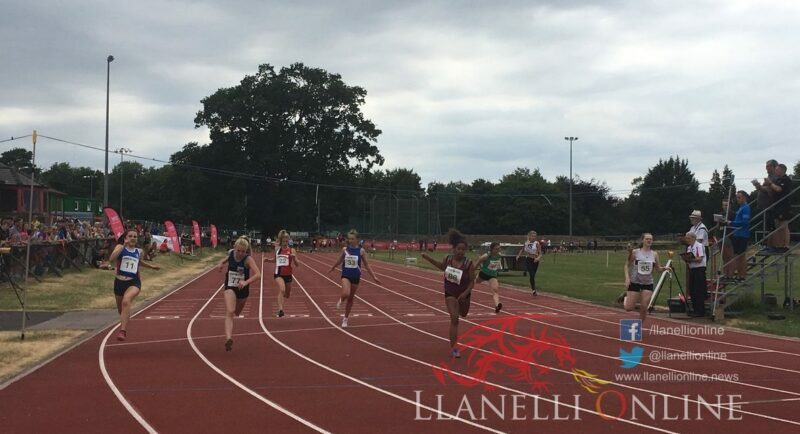 A WSAA under 20 team have also been chosen ahead of the Welsh Athletics Outdoor International in Swansea at the end of this month. 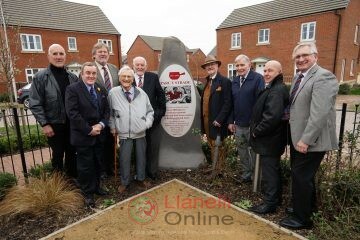 Teams from Wales and England will provide opposition that coming evening. 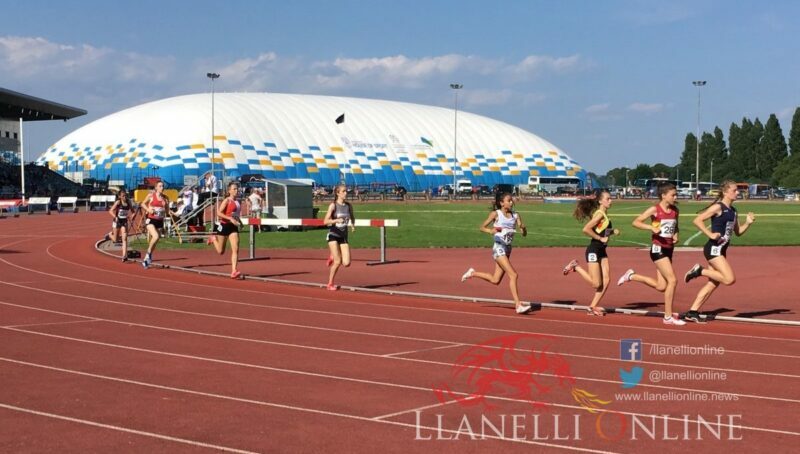 Dyfed secondary schools have an outstanding record in the Welsh schools athletics championships winning the overall inter team title 21 times in the last 26 years. 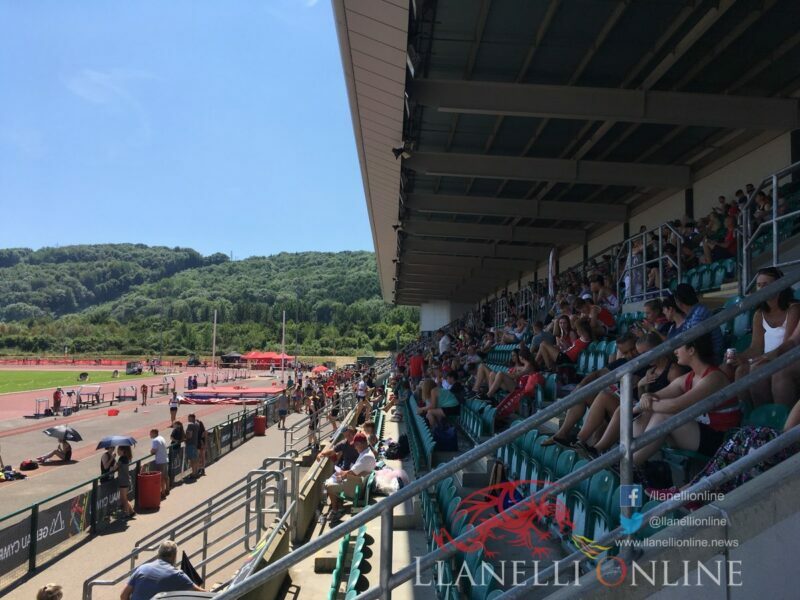 75 Dyfed athletes made the journey up the M4 to compete in the Welsh capital against tough opposition from Cardiff and Afan Nedd Tawe in particular. 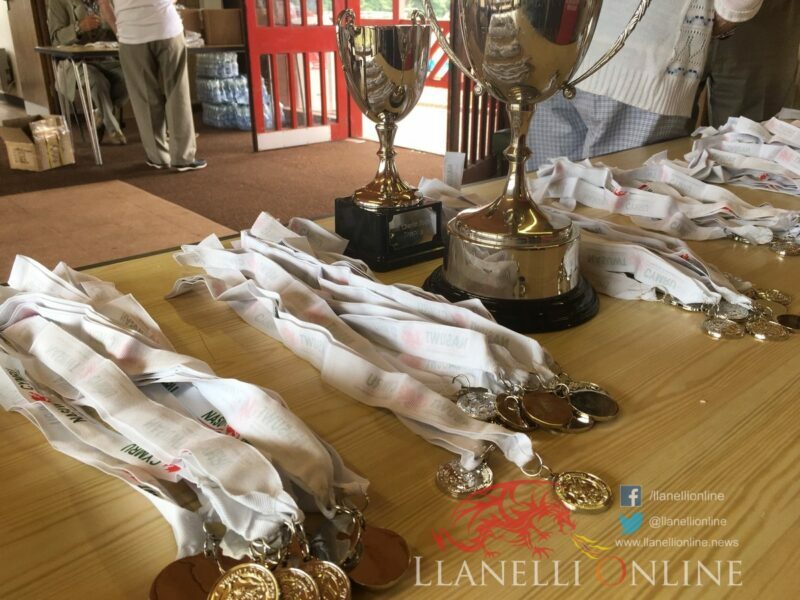 At individual level, Dyfed won a total of 69 medals, 28 gold, 28 silver and 11 bronze while in the team event on their way to third overall, the West Wales district took victory in the Junior Girls and Senior Girls categories. Senior Girls: Amy Evans (Coleg Sir Gar); Lucy Omnet (Pembroke); Sophie Hutchinson (Dyffryn Aman); Eliza Martin (Y Preseli); Cerys Davies (Bro Myrddin); Carys Jones (Maes Y Gwendraeth); Non Morgan (Bro Dinefwr); Alicia Samuel (Dyffryn Aman); Thea Jenkins (Dyffryn Taf); Danielle Jones (Coleg Sir Gar). Middle Girls: Mollie Dainton (Coedcae); Alice Evans (STP); Niamh Roberts (Coedcae); Lisa Cowdy (Penweddig); Lili Church (Aberaeron); Sophie Davies (Queen Elizabeth); Beca Roberts (Bro Pedr); Louise Mear (Dyffryn Taf); Chloe Fox (Emlyn); Ffion Davies (Y Preseli); Flavia Jenkins (Dyffryn Taf); Libby Gardiner (Greenhill); Ella Townsend (STP). Junior Girls: Nia Williams (Bro Dinefwr); Daisy Thompson (Bro Myrddin); Phoebe Davis (Bro Dinefwr); Kasia Cook (Llandovery College); Sadie-May Mason (Queen Elizabeth); Ella Wintle (Y Preseli); Abbie Thomas (Queen Elizabeth); Zara Evans (Henry Richard); Meleri Hopkins (Llandovery College); Thaia Davies (Bro Dinefwr); Amy White (STP); Amy Hughes (Queen Elizabeth); Ellie Loweth (Queen Elizabeth). Senior Boys: Caleb Nicholas (Y Preseli); Rhys Davies (Pembrokeshire College); Patryk Ganclerz (Coleg Sir Gar); Eli Oneyewu (Dyffryn Aman); Iestyn Williams (Bro Dinefwr); Carwyn Morris (Dyffryn Aman); Ben Woodnutt (St Michaels); Trystan Leech (Dyffryn Aman). 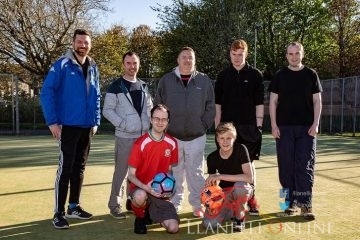 Middle Boys: Jac Williams (Bro Pedr); Lewis Jones (Bro Pedr); Jamie Walker (Aberaeron); Joseph Reynolds (Milford); Tomos Rees (Dyffryn Aman); William Lloyd (Y Preseli); Jac Doel (Bro Dinefwr); Andrew Salmon (Y Preseli); Iwan Glynn (Bro Myrddin); Harry Davies (St Michaels); Tyree Thompson (STP); Dylan Phillips (Y Preseli); Sam Bird (Bryngwyn); Osian Hill (Y Preseli); Louis Rees (Llandovery College). 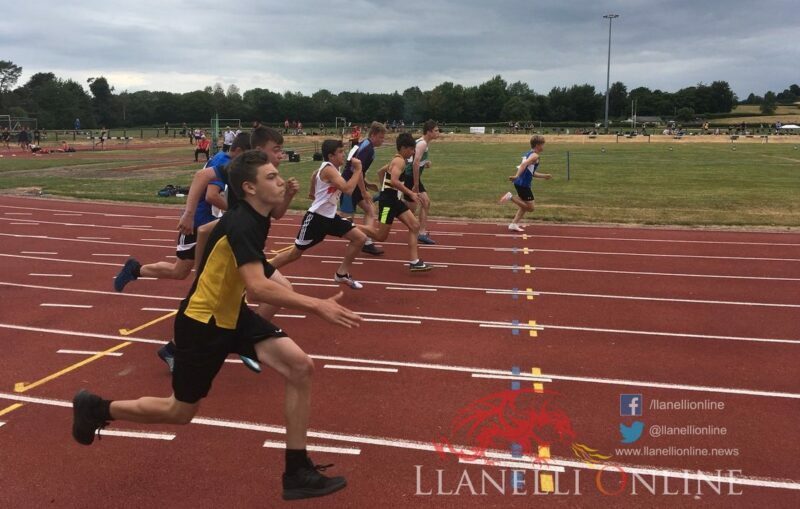 Junior Boys: Sam Pritchard (STP); Henry White (STP); Morgan Batten (Dyffryn Taf); Dafydd Jones (Bro Myrddin); Adam Beer (Glan Y Mor); Michael Jenkins (Y Preseli); Dafydd Pawlett (STP); Dafydd Waters (Bro Myrddin); Jacob Williams (Llandovery College); Tom Davies (Greenhill); Iestyn Gwiliam (Maes Y Gwendraeth); Jac Walters (Aberaeron); Joshua Hathoway (Penglais); Brook Fox (Glan Y Mor). Four days later on Wednesday 11th July, it was the turn of school teams to make the most of their opportunity during this busy period of the season. 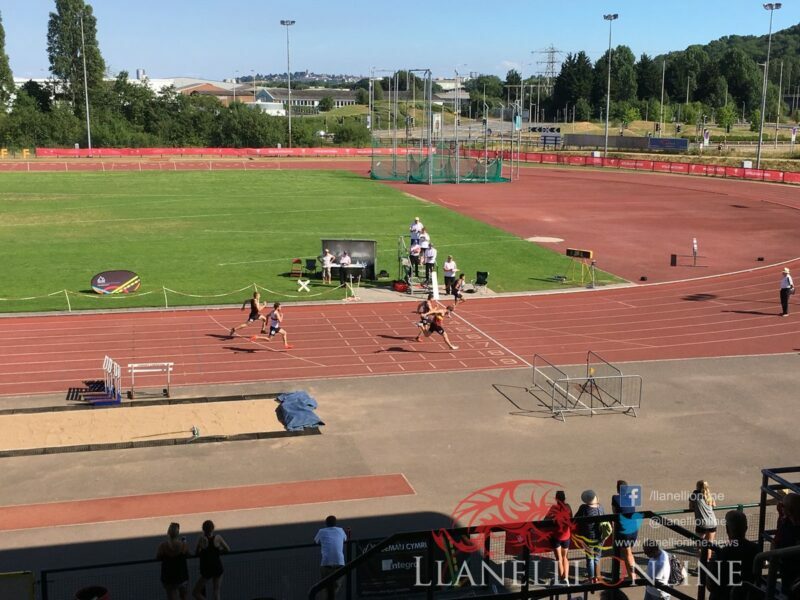 At arguably the biggest grass roots competition in the summer term, the NASUWT Cymru Wales Cup & Plate Finals took place at the Penlan Arena Track up in Brecon. The sprint hurdles started the action at 12 midday and team scores were announced 5 hours later when all events had been calculated and recorded. Other disciplines to take place were 1500m, 200m, 300m, 100m, 800m, 4 x 100m Relay, Long Jump, Triple Jump, High Jump, Shot, Discus and Javelin. Each representative taking part was awarded with a medallion in recognition of their achievement in being a member of the winning team within their district and progressing to these finals. 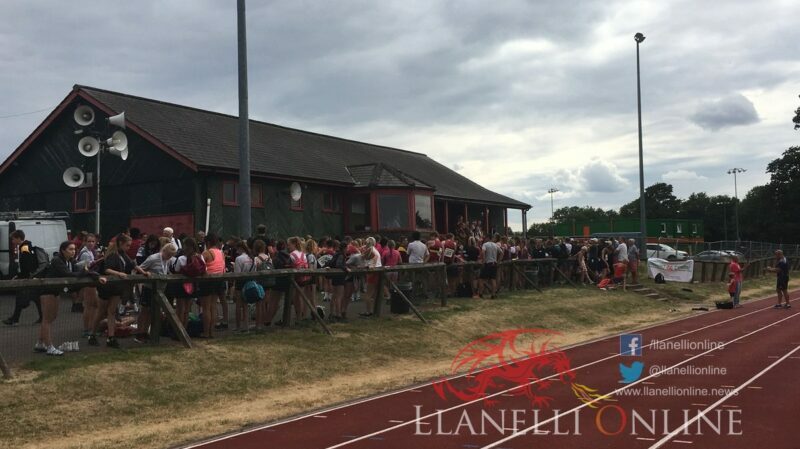 All team captains gathered outside the pavilion ahead of the final relays to be presented with medals on behalf of their respective teams from Chairman of Welsh Schools AA, Gareth Oldham. 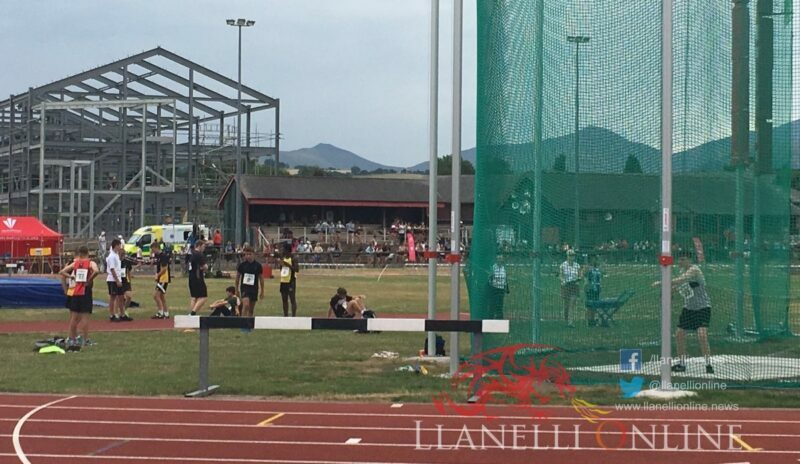 It turned out to be a great day of junior top class athletics up in Mid Wales on another relatively warm and dry day with conditions ideal to produce good performances and times. In addition, the competition did see a big number of new championship bests set in particular the long jump as well as distance events in general. With team scores close throughout the day, every single point was important in every position with more than half of the competitions coming down to the very last relay event where everything changed. 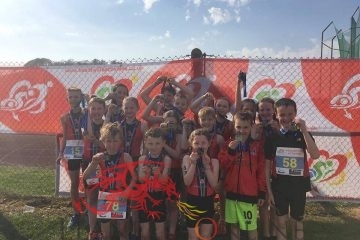 Five schools from the Dyfed district won their respective age groups in the Carmarthen final last month (20th June) and travelled to Brecon looking to compete with the best in the country in a competition full of high standard. All schools excelled, with numerous wins and top placing finishes. The best result of the day came from Ysgol Y Preseli, who were winners of the U14 Girls Cup Competition, finishing off in style with a win in the relay to ensure victory by a single point! In the U16 Boys age group, Sir Thomas Picton were 2nd in the Plate along with Ysgol Bro Myrddin in the Cup competition. Queen Elizabeth School secured third in the U14 Girls Cup with the fifth school, Ysgol Dyffryn Taf 5th in the Cup for U14 Boys.